My subscription copy of FLASH turned up right around this time, and it was a good one. How cold I not like it, given that it featured a young character who drew his own comics and super heroes, just like I did. The cover on this one is by Rich Buckler, who began being used for covers widely throughout the line at around this time, though not as exclusively as Ernie Chua/Chan or Nick Cardy before him. Buckler’s covers were always a bit hit-or-miss with me, often depending on who was inking him. This one suffers from some unattractive inking by Frank Springer. Inside, though, consistency reigned, as this was another story produced by the iron man team of writer Cary Bates and artist Irv Novick. 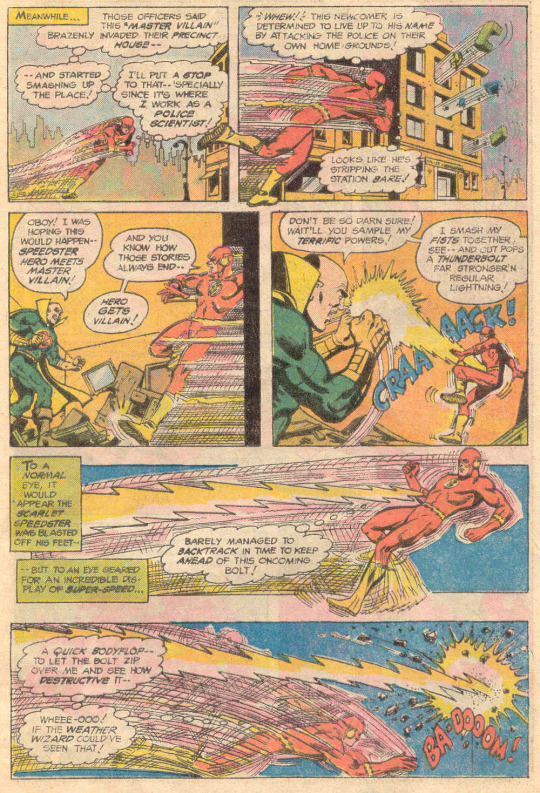 These guys produced a long string of issues throughout my youthful buying years, and that consistency made FLASH a very safe bet to buy (or subscribe to). You knew exactly the kind of story that you were going to get, and the style in which it would be told. 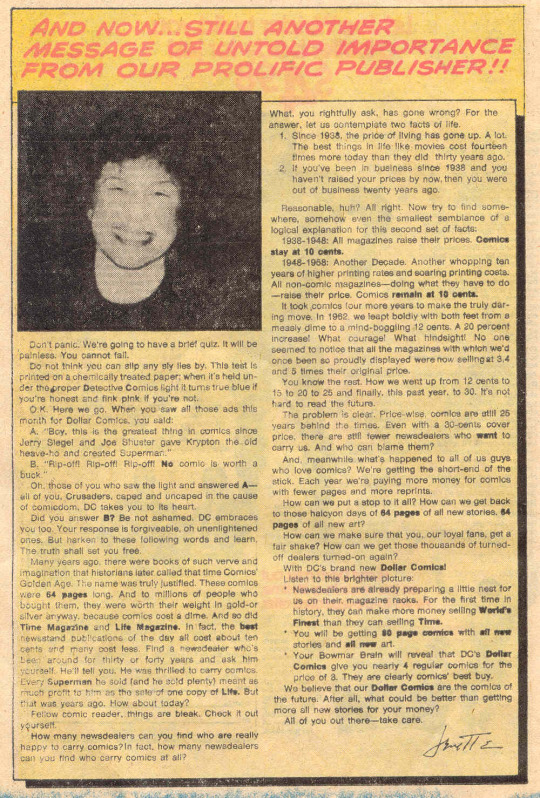 Cary, in fact, would continue with the series, through several editor changes, until its wrap-up in 1985 at issue #350–over a hundred issues from this one. The story opens with Barry Allen testing out a new camera he bought among the throngs of Central City, when he catches a glimpse of Daphne Dean, his childhood sweetheart turned movie actress, among the crowd. But before he can catch up with her, there’s an emergency and the Flash is needed–Heat Wave is robbing a jewelry emporium, using his flame-based talents to cause the air to shimmer like hot tarmac. Flash makes short work of him regardless. Returning home, Barry and Iris are visited by a Doctor who tells them that Daphne is suffering from amnesia due to a blow on the head she received during a film shoot. As she has no immediate family, the Doctor feels that spending time with Barry will help to jog her memory, which the Allens agree to. 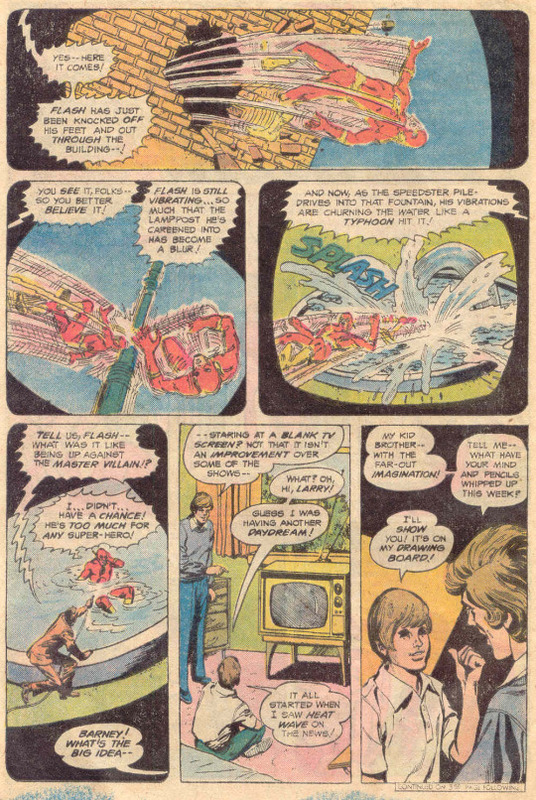 Meanwhile, next door, Barry’s young neighbor Barney Sands watches news reporting of Flash’s defeat of Heat Wave and then imagines the Scarlet Speedster up against the Master Villain he has invented in his imagination. This being a Julie Schwartz comic book, we next focus in on a gaseous alien being who has arrived at Earth. This entity craves new experiences, and is looking for a thrill. It briefly considers possessing Daphne Dean but instead is drawn by the powerful imagination of Barney Sands. Using his drawing of Master Villain as its template, it incorporates itself into a three-dimensional realization of the character that Barney has made up, literally pulling the drawing off of his drawing board. Master Villain makes his presence known by walking into the main Police precinct and tearing up the joint. But he’s got so many powers that nobody can stop him. 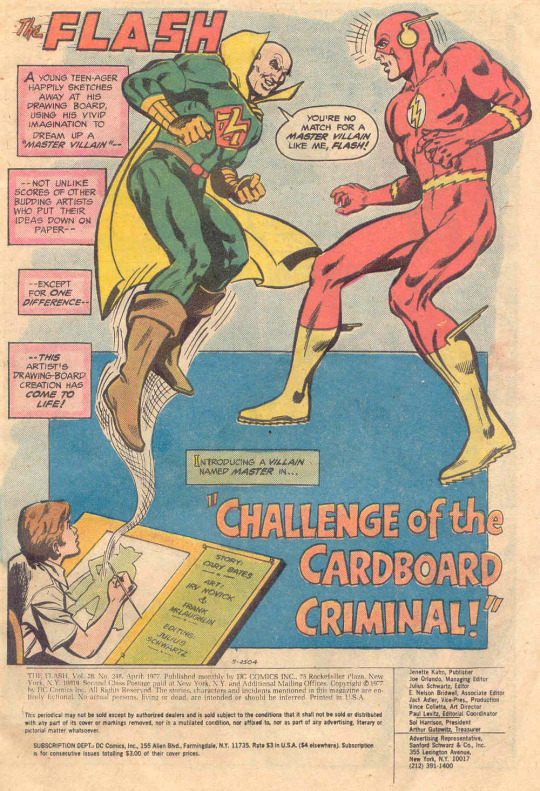 The Flash shows up to confront him, and the two wage a super-powered duel of wits, one that ends in a draw in which both the Flash and Master Villain are too discombobulated to continue fighting. But Master escapes, vowing to get the Flash next time. 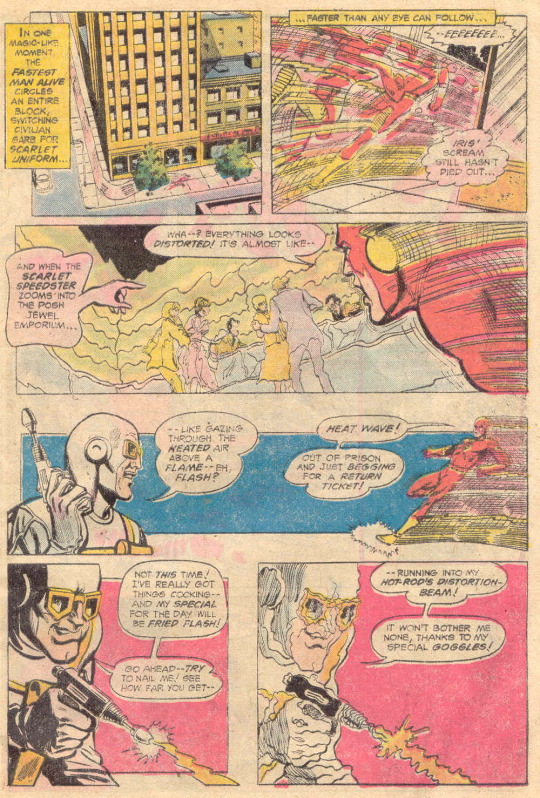 And Flash is confused by all of this–why his foe seemingly attacked the police for no reason, his bizarre assortment of powers, and the fact that he talks like a kid. And as the issue closes, we focus in on Daphne Dean, having broken away from nursemaid Iris Allen, as she makes a clandestine phone call to an unseen confederate. 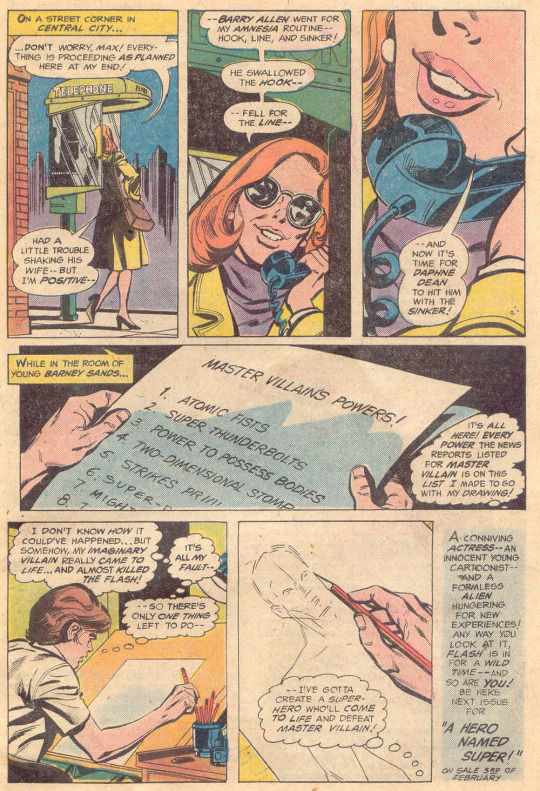 Her amnesia is a subterfuge, and she’s about to lower the boom on Barry Allen in some nefarious-seeming way! 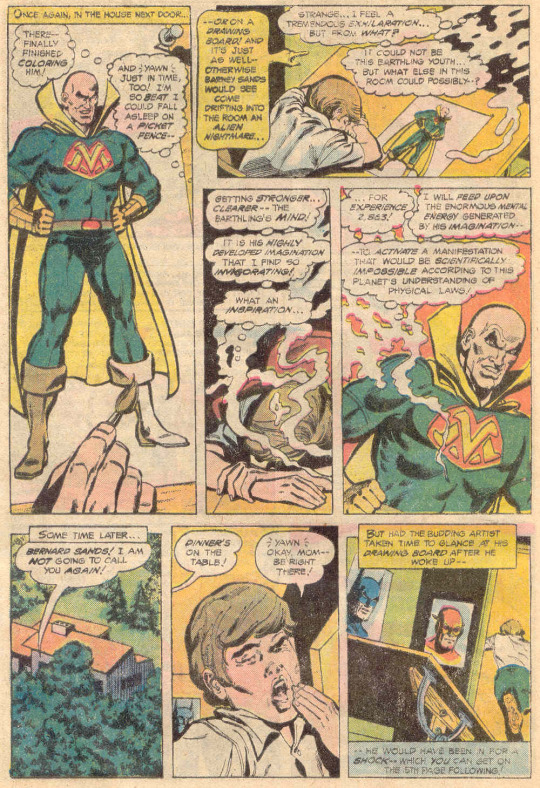 Elsewhere, recognizing that it was his own creation that was tearing up the Police, Barney Sands comes to the only conclusion that he can: he’s going to need to invent a new super hero to take down Master Villain. To Be Continued…!